- "wild" (common) form - olive-brown with dark spots. 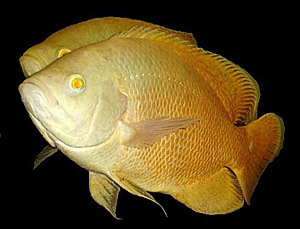 There are orange scales on the body, especially in lower and foremost part. 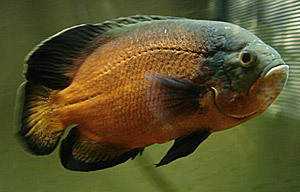 On the essential part of the tail-fin there is "an eye of a peacock's tail" - a black spot encircled with orange scales. 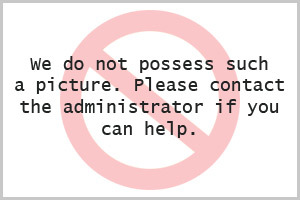 Formerly a popular form, nowadays it's getting uncommon, due to appearance of Red Tiger. 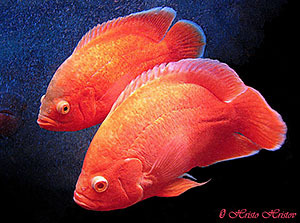 - "Red Oscar" - - a variety bred in the USA, almost whole body coppery-orange coloured. Only spine, dorsal fin, a part of snout and other fin fragments remain olive-colour or black. 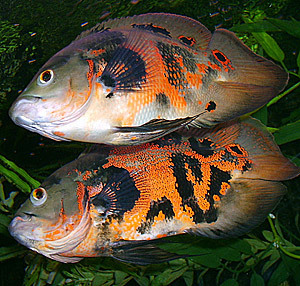 - "Red Tiger Oscar" - similar to common form, with black spots and stripes on a coppery to red background. 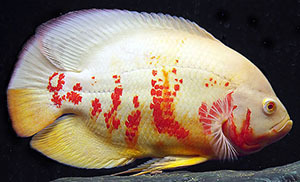 - "Albino oscar" / "Lutino Oscar" - this term contains all Oscar chichlid of a bright, basic body coloration. True albinos - without any pigment - are very rare. Offered in trade - mostly do not even belong to the group "Albino" , because of the black pigment, mostly on fins, sometimes also green or brown colour appears on the whole body (fish looks like a "dirty" albino). There's also an albinotic form of Red Oscar and Albino/Lutino Red Tiger. 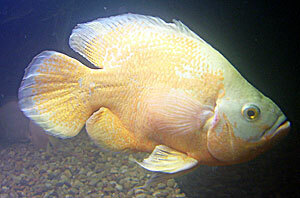 - That is how Albino Red Oscar looks like. - "Lemon Oscar" - a richly yellow body, or white with yellow spots. Please notice - poorly fed Red Tiger Albino/Lutino Red Oscar may also not develop a proper dark-orange to red coloration and may be similar to "Lemon" form. 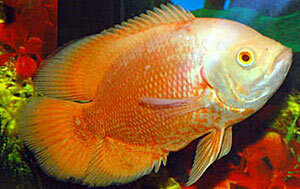 - "Golden Oscar" - colour disposition similar to "Red Oscar", however there is golden instead of coppery-orange colour. - "Bloody Oscar" - blood-red coloured body, bred in Singapore. 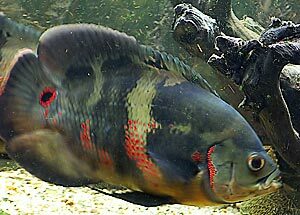 - it happens that fish are tatooed or dyed - called as "Blueberry" or "Strawberry Oscar". They are dyed accordingly blue or pink colouring substances. As far as dyed fish is concerned, the colour fades as the fish grows and finally we receive one from Albino/Lutino form. Tatoo is permanent. I suggest not to buy such fish because of inhumane treating. Despite of colour varieties, modifications comprised also a shape of body. 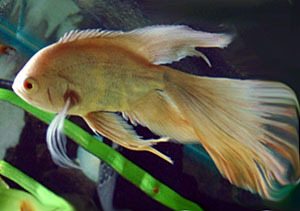 - "Veiltail Oscar" - long finned form, in all colour variations as above mentioned. "Baloon Oscar" - short-body form, "baloon" - most probably it's a genetic mutation that limits a growth of some vertebras. 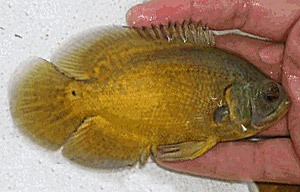 A deformed-body fish, exceptionally unshaped, probably would be traeated by a typical breeder as a waste during fish selection.